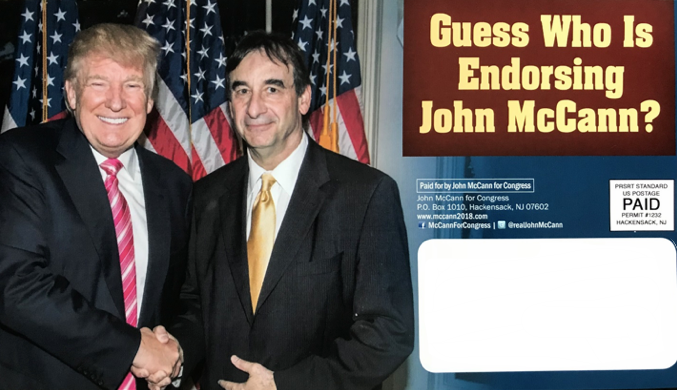 John McCann’s FAKE endorsements (starting with Trump)! Over the weekend, many of you received a mailer from the campaign of congressional candidate John McCann. The mailer was professionally designed and carried out by a well-known, national Democrat campaign consultant. Democrats have been a feature of the McCann campaign. John McCann was recruited from a Democrat office to run in the Republican primary for Congress. McCann was a $151,000 a year (plus benefits) Bergen County patronage employee – working for a Democrat office holder in a Democrat-controlled county – when he was plucked from obscurity to challenge long time conservative Steve Lonegan. McCann, an attorney, had a deal with his Democrat employers that was so good that they allowed him to collect $498,000 in “fees” in one year – that’s in addition to his full-time salary (with benefits). That’s right, he owes the Democrats a lot. John McCann is the hand-picked candidate of a party boss who was convicted on public corruption charges and sent to prison. McCann’s campaign chair is a liberal pro-abortion campaigner. McCann’s campaign manager holds contracts from Democrat politicians. The mailer used a controversial image of President Donald Trump. The image is controversial, because it has been obviously photoshopped to suit the needs of the campaign. And then it used the same suspect photograph that had been clearly photoshopped above. But this is a clear lie. Donald Trump has not made an endorsement. To make matters worse, on the reverse of the mailer, the McCann campaign listed several endorsements that also turned out to be lies. “This is Freeholder Herb Yardley. Some of you may have received a mailer from candidate John McCann claiming that I endorsed him. That is not true, I endorsed Steve Lonegan for Congress. Now McCann is running a radio ad that lies about our Senator, Steve Oroho. In fact Steve Oroho and Mike Doherty are the two most conservative Senators in New Jersey, according to the American Conservative Union. 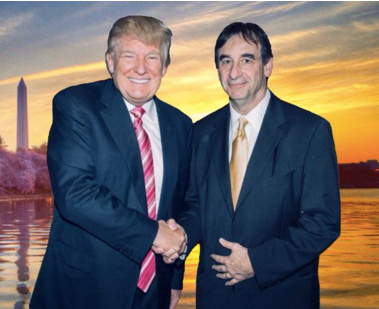 Former Congressman Scott Garrett also issued a statement claiming that Sussex County Freeholder Carl Lazzaro had also not endorsed John McCann, despite being listed as an endorsee on the McCann mailer. See, this is how Democrats do it. They lie. With so many Democrats around him, McCann can’t help it. He lies too. We learned that Sussex County Freeholder Jonathan Rose did endorse John McCann for Congress, although he is not listed on the mailer. The reason for that is probably a reluctance by McCann to list a public official who supports Governor Phil Murphy’s position on the legalization of marijuana. Hey, McCann is a liberal, but he’s not that liberal. In supporting McCann, Freeholder Rose apparently takes a liberal stand on abortion and gun control. Lonegan is staunchly pro-life, and recently told an audience at the Knights of Columbus in Fair Lawn that he'd support every anti-abortion bill that came before him. He's tried to tag McCann as being pro-choice, but McCann says the label doesn't fit. "I believe that life begins at conception," McCann said. "The law is what is," he said. Hey, that’s NOT Pro-Life. That is pro-status quo, which equals, pro-abortion. Both candidates wrap themselves in the Second Amendment right to bear arms. McCann favors requiring universal background checks perspective gun buyers but Lonegan opposes them they would just "add another layer of bureaucracy." Ditto on the Second Amendment.